Havana is one of those places that conjures up romantic images from the 40s and 50s, or Hemingway memories. Llilian Llanes has put together this, one in a series of Then And Now books for Thunder Bay Press, an array of photographs depicting how things were and how they are now in Havana, Cuba. Obviously a little Spanish influence in the buildings but many have European influence. Many of the buildings, some by Cuban architects, have thankfully been preserved, which is great for tourism, on which Cuba heavily relies. Not without its own political turmoil and battles, Cuba still seems to be a favorite vacation destination even though the latter half of the twentieth century saw little to no architectural growth. Thanks to Havana being declared a UNESCO World Heritage Site in 1982, restoration has been ongoing and from the illustrations in the book, you'll see for yourself. Having a natural harbor, Havana became a stop on the way for many ships bringing in goods and shipping out sugar, rum, and tobacco. Many of the old customs buildings still remain and by all accounts, seem to have weathered the changes well. I loved the Plaza de la Catedral which seems timeless, the beautiful original Alameda de Extramuros (El Prado), the magnificent Hotel Plaza, the exquisite Gran Teatro de la Habana, and the chapel at the Columbus Cemetary. A lot of Baroque and colonial influence can be found in Havana buildings. I've also reviewed their books on Rome, San Francisco, and Las Vegas and there are many other cities too, like London, Chicago, and New York to name a few. 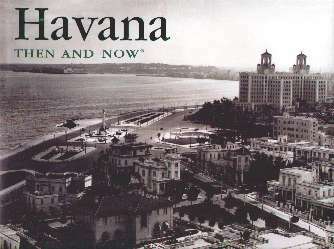 HAVANA Then And Now may be purchased and/or ordered through your local bookstore.